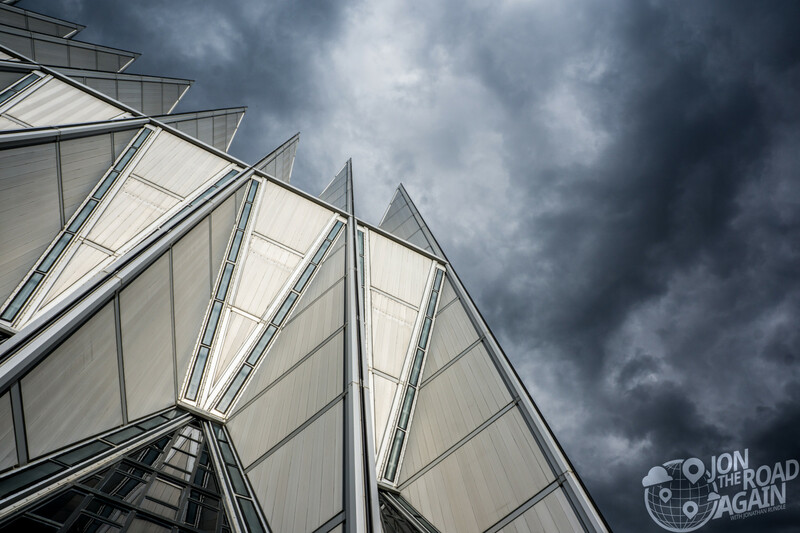 A must-see attraction in Colorado Springs is the Air Force Academy Cadet Chapel. 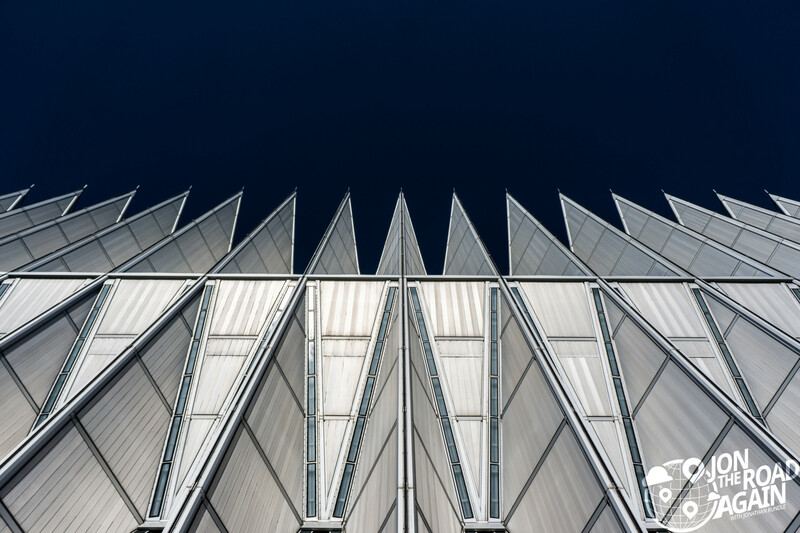 Built in 1962 by famed architecture firm Skidmore, Owings and Merrill, the originally controversial chapel has since been awarded numerous architecture awards and named a National Historic Landmark. 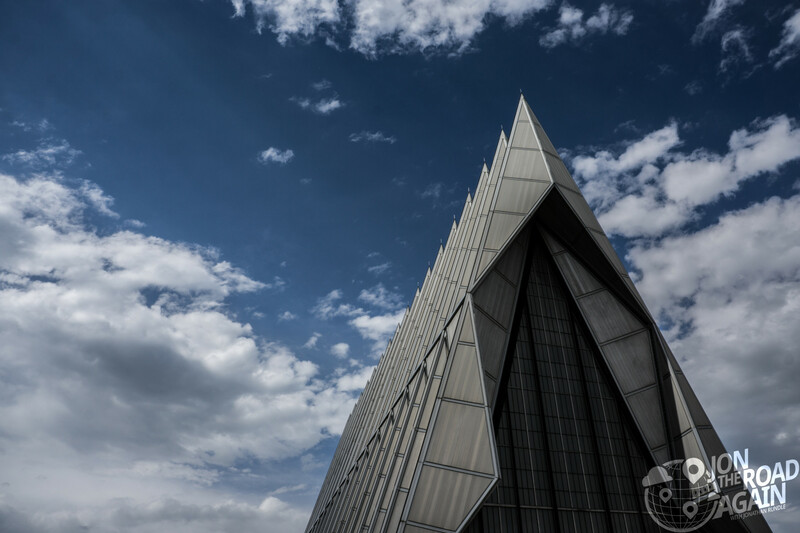 Looking like it’s ready for takeoff, the chapel’s seventeen spires all point to the heavens, where the object of worship lies and where these cadets will spend their days. The structure is a steel frame of 100 identical tetrahedrons, each 75 feet long, weighing five tons, and enclosed with aluminum panels. These tetrahedrons are spaced a foot apart, creating gaps in the framework that are filled with 1-inch-thick colored glass. Total cost of construction was $3.5 million. 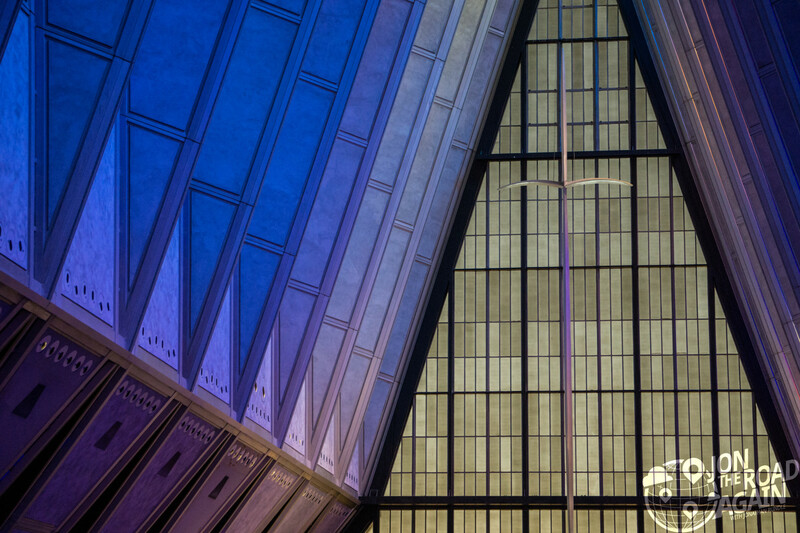 Inside the Air Force Academy Cadet Chapel, there are three distinct chapels to serve cadets of different faiths. Inside, the walls are painted in soothing blues and purples with bursts of orange and red throughout. Coming in from the cold aluminum of the exterior and seeing all of this color was a surprise. I expected the repetition of folds to be impressive, along with the soaring height (94 feet) of the ceiling, but the feeling you get – especially on a sunny day – is remarkable. 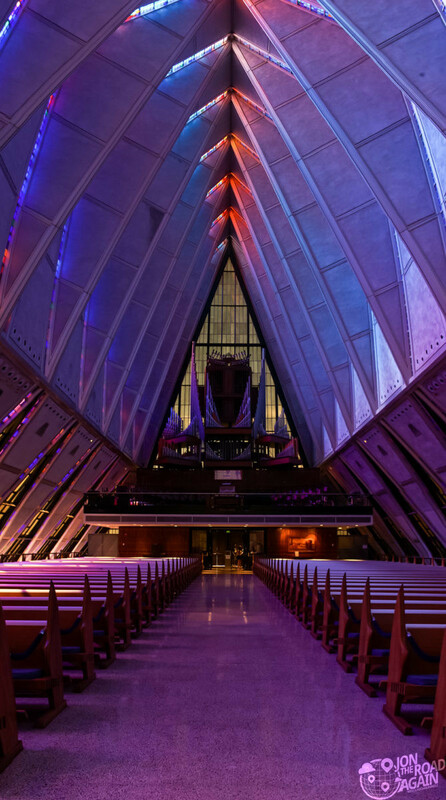 You certainly get a feel that this chapel is for airmen. The cross at the front of the chapel is 46 feet tall, 12 feet wide and made of aluminum with an arching horizontal crossbar, which made me think of a bird’s wings or a propeller. The pews are American walnut and African mahogany and will seat 1,200. Pews are sculpted at the ends to resemble a WWI propeller and are capped with aluminum, resembling a WWII fighter’s wing. The organ, like most, is at the rear of the chapel in the choir balcony. Designed by Walter Holtkamp of the Holtkamp Organ Company, and built by M. P. Moller of Hagerstown, Maryland. 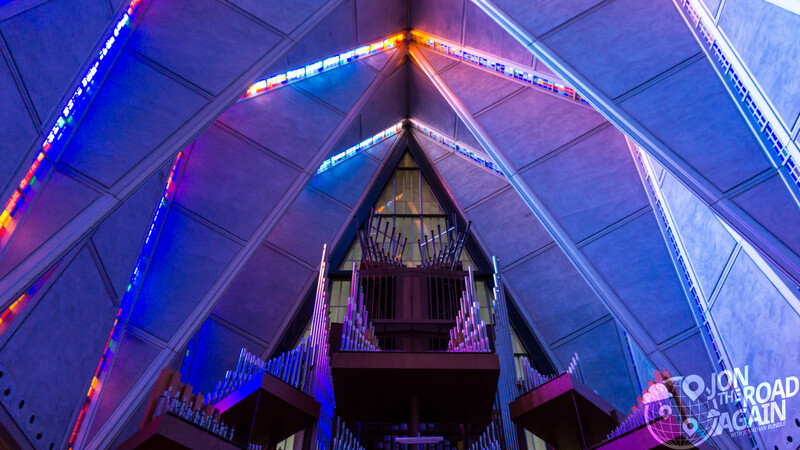 The organ has 83 ranks and 67 stops controlling 4,334 pipes. 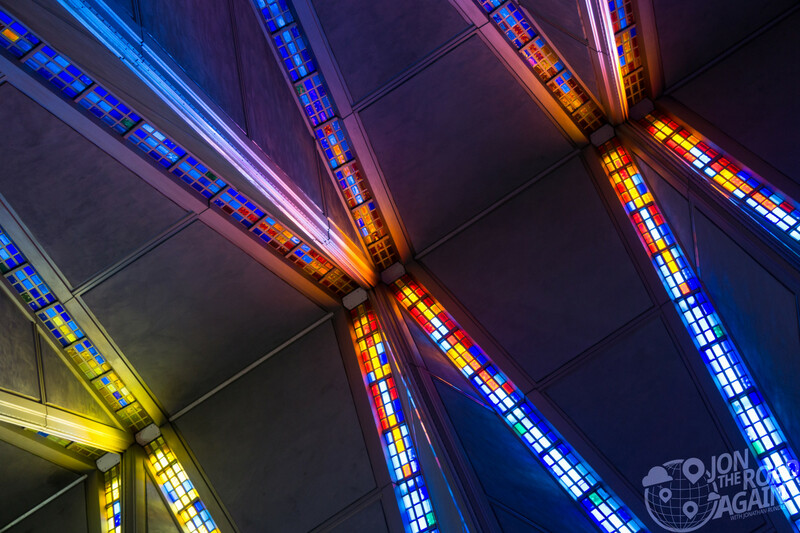 The stained glass between the aluminum panels progresses from darker at the rear of the chapel to lighter as you approach the altar. 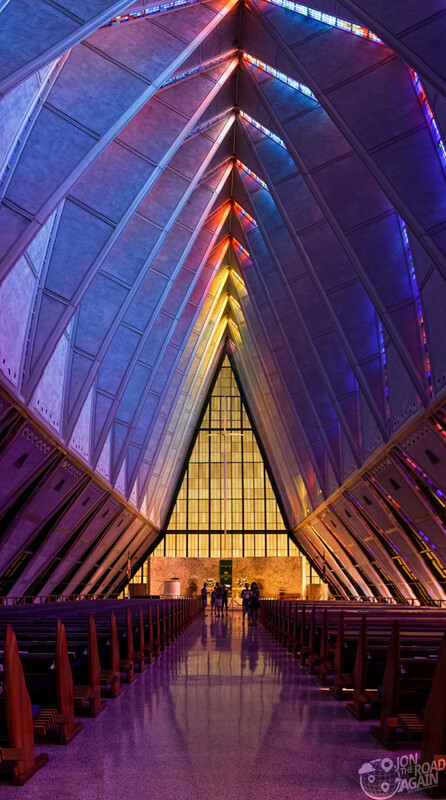 The catholic chapel is the second-largest chapel on site with the ability to hold 500 people. 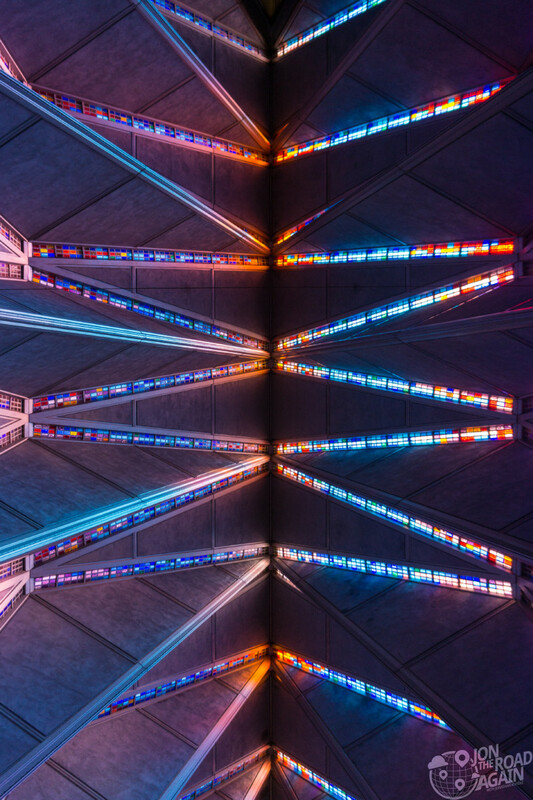 The focal point of the Catholic Chapel is the reredos, an abstract glass mosaic mural designed by Lumen Martin Winter and composed of varying shades of blue, turquoise, rose and gray tessera to form a portrayal of the firmament. Superimposed on the mural and depicting the Annunciation are two 10-foot tall marble figures, the Virgin Mary on the left, and the Archangel Gabriel on the right. 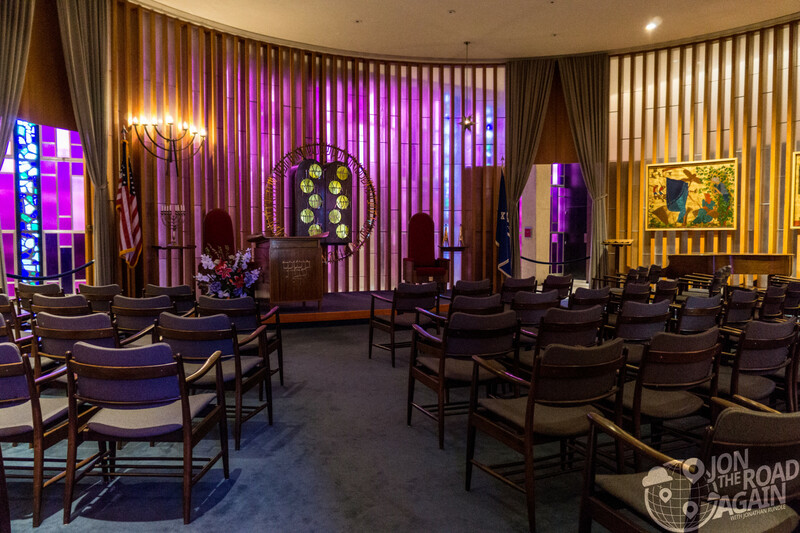 Seating 100, the Jewish chapel is circular, with a diameter of 42 feet. The circular form and transparent walls were used to suggest a tent-like structure, like when God spoke to Moses in the Tent of Meeting. The floor is paved with Jerusalem brownstone, donated by the Israeli Defense Forces. 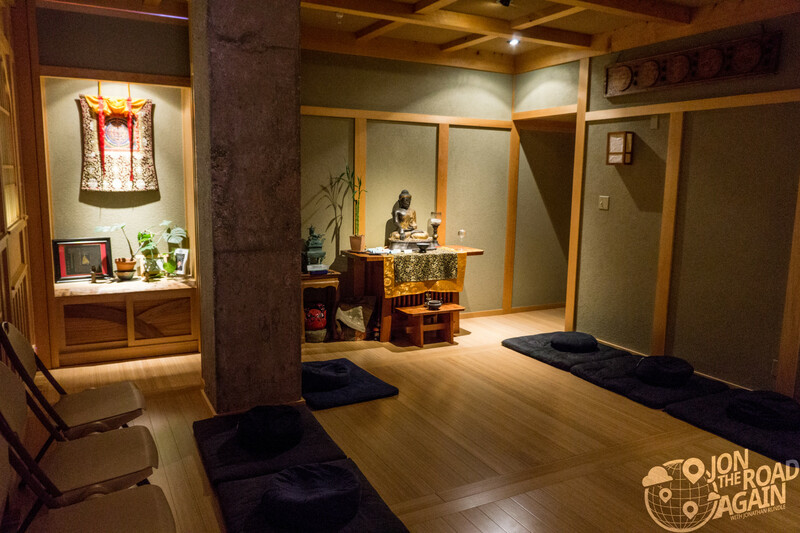 The newest addition to the building is the Buddhist Chapel. Just 300 square feet, the small room was added in 2007. One last look to the skies as we head back from the lower chapels. Those spires are fantastic. Nearby, there is a sculpture garden with tributes to the airplanes and people who have contributed to the air force. I captured this photo of the sculpture I found to be the most poignant. 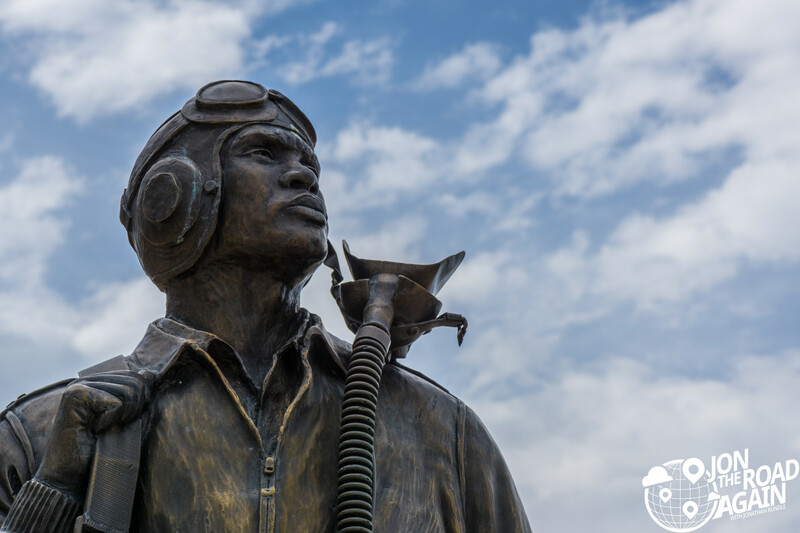 It commemorates the achievements and sacrifices of the Tuskegee Airmen, the first all-black pilot squadron in the US Armed Forces. 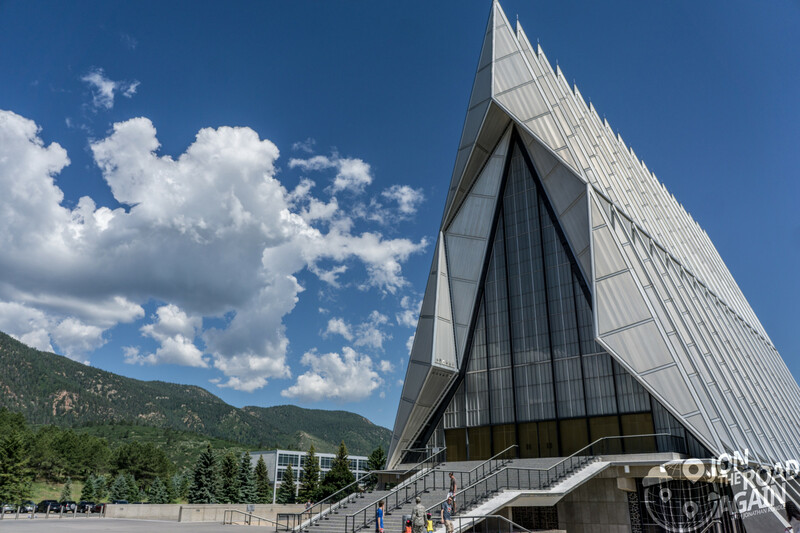 Getting to the chapel is fairly easy, just be aware you are on a military base. That means there will be a checkpoint where they look at your ID’s and perhaps look in your trunk. Once you’re past the checkpoint it’s a 5 minute drive to the chapel. Chapel admission is free. Be aware a chapel may be closed if there is an event (like a wedding).